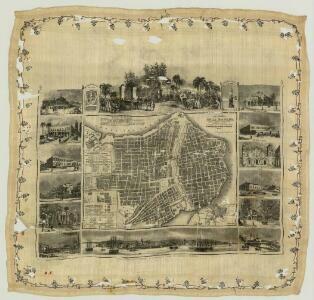 This map of the city of Havana is contained within an 1851 atlas: Atlas de España. Isla de Cuba. Cuba was a territory of Spain at the time. Text in Spanish. An exact plan of the fortifications of the Havana and the adjacent forts, with the new batteries, &c., most humbly dedicated to His Royal Highness the Duke of Cumberland, by Lieut. Hugh Mackay, late of the Marines, taken by him on the spot. March, 1749," with the soundings; drawn on a scale of 3 3/4 inches to an English mile; with a plan of Fort Coximal, on a scale of 9 1/2 fathoms to an inch." 1 : 910000 Gauld, George. The Island of Cuba with part of the Bahama Banks & the Martyrs. Cuba : part of chart "E"
Mapa Historico Pintoresca Moderno de al Isla De Cuba. 1 : 3472615 May, B. y Ca. 1 : 3300000 Mitchell, Samuel Augustus Jr.